Russian Museum and Park Complex in Jericho. The name of the city of Jericho comes from the ancient local cult of the moon (yareach) and means literally - the moon. This most low-lying (250 m below sea level) and the ancient city on earth, a city with a deep and rich history, is located in the Jordan Valley, 7 kilometers from the Jordan River and 12 kilometers from the Dead Sea. From the west the city is separated by a steep array of mountains of the Judean Desert. The presence of freshwater sources and rainwater streams from the mountains in winter and watering the Jericho Valley has turned this area into a blooming oasis and provided early settlement. As a result of the unique location of the city, it formed a tropical climate: in winter with a temperature not lower than +15 - +18, in summer the temperature rises to +45 degrees Celsius. It is no accident that Jericho is mentioned in several places in the Bible as Jericho is a city of palm trees. According to the Arabic proverb "the head of a palm tree should burn in fire, and legs should stand in water". The abundance of water and heat provided all the necessary conditions for the cultivation here of this important product of the oldest civilizations. "And Moses ascended from the plains of Moab to Mount Nebo, to the top of Pisgah, which is against Jericho, and the LORD showed him all the land of Gilead until Dan himself, and all the land of Naphtali, and all the land of Ephraim and Manasseh, and all the land of Judah, west of the sea, and the noonday country and the plain of the valley of Jericho, the city of Palm, to Sigora. And the LORD said unto him, This is the land of which I sware unto Abraham, unto Isaac, and unto Jacob, saying, Thy seed will I give it. I have given you to see it with your eyes, but you will not enter it. " (Deuteronomy, Chapters 34. 1-4). The old city of Jericho with all cultural layers is a mound (Tel) - a height of 21 meters, which in Arabic is called Tel es Sultan. As a result of the most significant archaeological excavations conducted in Tel-es-Sultan expedition in 1930-36. (G. Garstang) and in the years 1952-61. (KM Kenyon), scientists were able to find traces of the transition from hunting and gathering to agriculture and the beginning of the emergence of urban civilization with the emergence of city walls, towers, and buildings made of unfired bricks. The layers of the period of the pre-ceramic Neolith are found - 9 thousand years BC, which makes Jericho the most ancient city from all known cities of the world. "Then [Jesus] entered Jericho and passed through it. And behold, one named Zacchaeus, the chief of tax collectors and a rich man, sought to see Jesus who He was, but could not follow the people, because he was small, and, running ahead, climbed up on the sycamore to see Him, because He had to pass by it. Jesus, when he came to this place, looked, saw it and said to him: Zacchaeus! Come down quickly, for today I must be in your house. And he hastily descended and received Him with joy. And everyone saw this and began to murmur, and they said that He had gone to a sinful man; Zacchaeus, having become, said to the Lord: "Lord!" I'll give half of my estate to the poor, and if I offend anyone I'll pay back. Jesus said to him, "Now salvation has come to this house, because he is also the son of Abraham, for the Son of Man came to seek and to save that which was lost." (Luke 19. 1-10). During our trip we will be able to visit a unique Greek Orthodox monastery on the Temptation Mountain in the western vicinity of the city. Built on a mountain, identified with the described in the Gospels the place of the temptation of Jesus Christ by the devil. In memory of this event, the monastery itself and the mountain on which it is located (mountain of Temptation, Forty-day Mountain or Mount Karantal) were named at the beginning of the IV century, by the efforts of the preacher. Hariton Confessor. All the internal premises of the monastery are cut in the rock, and in the cave where, according to the legend of forty days, Jesus Christ fasted during his stay in the desert, a small church (or the chapel of Temptation) is built. The throne of this church is arranged over a stone on which, according to legend, Christ prayed. The Greek Orthodox monastery of the prophet Elisha is in the heart of modern Jericho and a part of the tree of the evangelical publican Zacchaeus is preserved inside his court. For more information about the city of Jericho, see the article by Pavel Platonov, "The Russian Footprint in the History of Jericho: Towards the 10th Millennium of the Most Ancient City on Earth." 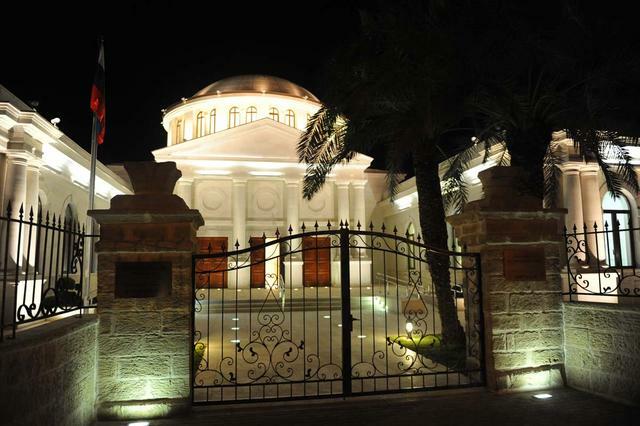 The Russian museum and park complex in Jericho, opened in January 2011 with the participation of Russian President Dmitry Medvedev and the head of Palestine, Mahmoud Abbas, is built on the historical site of the Imperial Orthodox Palestine Society. The complex includes archaeological and landscape parks, a sacred fig tree (sycamore), revered as the tree of the publican Zacchaeus, a historical museum. One of the important places of visit for the modern Russian pilgrims in the Jordan Valley is the Greek Orthodox monastery of St. Gerasim of Jordan. The convenient location of the cloister to the southeast of Jericho and not far from the authentic site of Epiphany on the Jordan River makes this place a must for modern pilgrims of the Holy Land and numerous tourists. The shady courtyard of the unique monastery building, the special architecture of the ancient walls of the monastery, the beautiful monastic grounds in the form of a tropical monastery garden, drowning in the shade of oleanders, date palms and other trees make this place a genuine pearl and spiritual oasis in the arid desert of the Jordan Valley. More information about the monastery prep. Gerasim of Jordan see the article by Pavel Platonov - "Monastery of the Monk Gerasim of Jordan in the Jordan Valley". Bethwara (Greek Βηθαβαρᾶ, Hebrew בית עברה - house of the crossing, place of the ford) - a place on the Jordan River, 10 kilometers north of the confluence of the Jordan River to the Dead Sea, where the ferry crossed the river. The place is associated in the Christian tradition with the Baptism of the Lord on the Jordan River, as well as with the crossing point of the sons of Israel, who crossed the Jordan together with Joshua, leaving an altar of 12 stones at the crossing site, according to the number of tribes of Israel, and then entered the promised land. The book of Joshua describes this event as follows. The Gospel of Luke describes the Baptism of the Lord on the Jordan River. The place of Baptism was closed for a wide visit until 2011. Now this place is open for visiting pilgrims and tourists from all over the world and is in charge of the National Parks Protection Society. The excursion begins at the place of accommodation of the tourists in Jerusalem (the address and time of the excursion beginning is indicated in advance by the guide). On the tour you need to have comfortable shoes, drinking water and a hat from the sun. Clothes should be like when visiting temples (men should not visit temples in shorts, women should have clothes with closed shoulders, do not have a neckline, short skirts and shorts, you can wear trousers). To cross the border post between Jerusalem and Jericho, tourists need to have a passport with them.